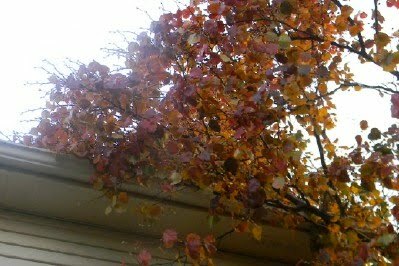 I won't lie--I have hated the ornamental pear in my front yard for years! It has a low branch that I whack my head on everytime I do yard work, it keeps its bazzillion leaves until well into December forcing me to freeze my tail off to rake up the mess when the massive leaves fall, it falls apart, piece by piece, every time the wind blows--and it has created many heated outdoor debates between this mama and her husband. I can agree that 8 years ago, the two ornamental pear trees and the centered maple tree were pretty. They were well pruned and truly added to our landscaping. We had the nicest trees on our street--then within weeks we had two dangerous menaces. The first ornamental pear was taken out in in a one two punch between an ice storm and a wind storm several years back. 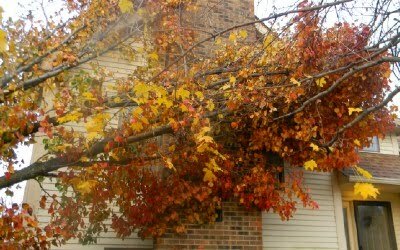 The big windstorm, a wild storm in which Ohio saw the remnants of Hurricane Ike, also took out a third of the second pear tree. I said we should take it down, it looked ridiculous...I was outvoted by my husband one to one and somehow still lost. God apparently thought that I would be bored today once the girls were off to school--or perhaps deserved to be rid of that awful tree after three years of having a weird, 3/4 round tree in my front yard. For whatever reason He decided, the Central Ohio weather kicked up 12 hours of rain, 40 degree temperatures and a late evening windstorm. 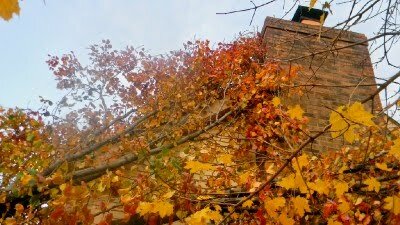 There is now 2/3 of that awful remaining pear tree perched and dangling precariously on my roof, gutters and brick chimney. Between chauffering the girls about this morning, I have met with three tree removal services and think we have chosen a winner! Donley Complete Tree Care has offered to get the tree off my house and out of my hair this afternoon. Rather than lamenting Murphy's Law, I guess I should just be thankful that the tree didn't land in my neighbor's garage--or the middle of our living room, right? And that I'm finally rid (almost) of that awful tree!